Earlier today I published a comprehensive review of the new Lufthansa First Class Lounge in Munich. But I figured one aspect of the lounge merited its own post. 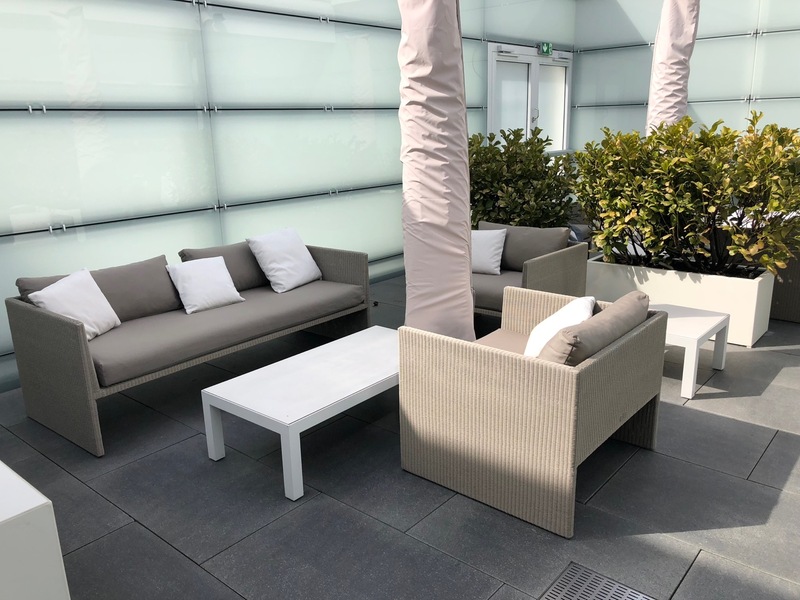 That’s the outdoor patio–the one thing that the Lufthansa First Class in Munich has that the nether the First Class Terminal nor any of the First Class Lounges in Frankfurt offer. You might ask what the big deal is about a patio. I’ll tell you — it’s nice to have some fresh air after a long flight without having to go through security again. The patio/terrace seats about 25 comfortably and is open year-around, as long as it it not raining or snowing. You’ll note the heat lamps are covered, but such heaters create the possibility of enjoying the patio even on cold days. The Lufthansa First Class lounge in Munich joins other great lounges like the Star Alliance Lounge at LAX, United Club at LAX, Delta SkyClub at JFK, and SWISS First Class Lounge at ZRH that offers comfortable outdoor seating. Rather than simply dismiss this as a gimmick, I believe this makes a lounge far more inviting. It is something Frankfurt will hopefully get if the lounges there are ever refreshed. Do you really think that the United Club at LAX and the Delta Sky Club at JFK qualify as great lounges? I’ve never visited either, so I want your perspective on that. In terms of “typical” United Clubs and SkyClubs, I would say. SEA SkyClub is best in the system, but these are both very decent lounges. The one time I tried using the outdoor portion of the United Club at LAX, I was overwhelmed by the smell of exhaust. That’s the only outdoor lounge area I have experienced- was that a fluke or is that standard?